General Elections 2019: Congress is likely to announce names of its candidates for all seven Lok Sabha seats in the national capital over the weekend, reports said. Lok Sabha Elections 2019: Sheila Dikshit is chief of the Congress Delhi unit. Congress president Rahul Gandhi is keen that Sheila Dikshit, chief of the party in Delhi, contest the ongoing Lok Sabha elections but the former Chief Minister has sought time to consult her family, sources have told NDTV. The Congress is likely to announce the names of its candidates for all seven Lok Sabha seats in the national capital over the weekend and Ms Dikshit may be fielded from East Delhi, reports say. "The list of all the seven candidates is expected to be released on Saturday," All India Congress Committee (AICC) in-charge of Delhi unit PC Chacko told news agency PTI. 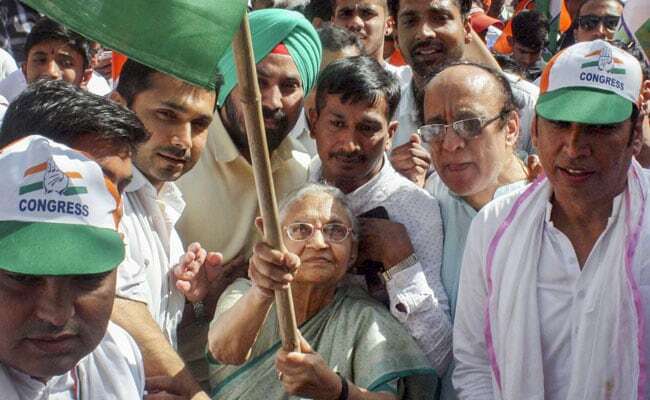 Sheila Dikshit's name is under "serious consideration" as the candidate from East Delhi, said a senior party leader, adding she may be fielded if her son Sandip Dikshit declines to contest, news agency PTI reported. The party has also shortlisted the names of former Delhi minister Yogandnand Shastri and Olympic medal winner Sushil Kumar for the South Delhi parliamentary seat, it said. "In view of significance of Purvanchali voters in the national capital, the party can field former MP Mahabal Mishra from West Delhi that has a sizeable population of the community belonging to Eastern UP and Bihar," the source said. The party is likely to field former Union minister Kapil Sibal from Chandni Chowk, former Delhi minister Rajkumar Chouhan from North West seat, former state unit chief Ajay Maken from New Delhi and former MP J P Agarwal from North East Delhi constituency, PTI reported. Meanwhile, after months of speculation, the Congress today made it official and final - the party will have no alliance with Arvind Kejriwal's Aam Aadmi Party (AAP) in Delhi for the national election that started on Thursday and will be held in six more rounds. The two parties had even arrived at a pact for Delhi - four seats for AAP and three for Congress - PC Chacko said. He countered AAP and said his party chief Rahul Gandhi had pushed for the alliance. "The Congress president had given me assignment clearance to go and discuss with AAP. The political necessity is we should come together and defeat the BJP," Mr Chacko told reporters.